There is a mortal sin occurring all over America today. As you read this, thousands of people are throwing their Thanksgiving turkey carcass into the trash. I have witnessed it even in professional kitchens. There should be a law. A turkey is such a beautiful thing. You get a fantastic meal for the big day, and you get a bunch of bones to make something out of when it's all said and done. For me, the carcass is the prize part of the bird. I can't wait to get all the meat off of that turkey to start working with the bones. Working with the best ingredients drives my passion for cooking. The best ingredients are not always something you buy, but they can be something you can create by paying very close attention to painstaking details in the cooking process. One of the foundations of good cooking in my humble opinion is the use of the proper flavor base. In most cases, for me, that means cooking with homemade stock. A broth made from bones is how I define the term "stock." Broth is defined as being made from meat or vegetables. So, to make a stock, you boil a bunch of bones in water, and there you have it. Seems simple right? Actually, it is simple. Yet, by paying attention to what may seem like inconsequential detail, you can create a stock that can stand on it's own as a soup or consomm. A good stock will infinitely increase the quality of your cooking by adding complex flavor, aroma, and a little-talked-about feature called "mouth feel" that you can't get any other way. So, what's the big deal? You boil a bunch of scraps, and you get a liquid that has flavor. Just about any attempt at making stock will produce something you can use. You can even use bouillon or canned broth and get something edible. So what? Why should you spend five hours or more waiting around for stock to finish cooking? All I have to say to that is try it once, and you will be hooked. When you sip a spoon full of rich, gelatinous stock, and the deep flavors and aroma coat your palate completely, you will know what stock is. Besides, your house will smell fantastic. You will have a hard time settling for the other stuff, unless you just don't have the time to make your own. If I'm reaching you too late for your Thanksgiving bird, I'm sure there's another turkey in your future, probably in December. So, let's make some stock! First, debone the meat from your bird. There is meat all over the place, I promise! You will likely find about a pound of dark meat on the underside of the bird. Slice off anything that can be sliced from the breast. Pull the rest of the meat off of the bones. Pay particular attention to the dark meat. When taking the meat off of a chilled drumstick or wing, you will run into a lot of tendons. Be sure to pull the meat away from those tendons. You will want to keep all the scraps of bone and tendons and skin for the stock, so don't throw it away. Now that you have all the meat, it's time to prepare the bones. You can usually break the carcass in half by bending it from either end with the breastplates up, bending the backbone towards itself. Then you can use a cleaver or a large chef knife and chop it down the spine to spread it open. The goal here is to make it fit into your pot without having to use too much water. You don't want a lot of air space in the bone stack you are making in your pot. Arrange the other bones, wings, legs, thighbones and neck (f you didn't throw it out) in the bottom of your pot to get rid of any large air pockets. If there are any drippings still in the pan that have turned to jelly, you want to add those to the pot, too. You can add a little water to the roasting pan and scrape it with a wooden utensil to get all the good stuff out of the pan. This is the epitome of total utilization, and you should feel good about not wasting any part of this bird when you are all done. Cover the bones with COLD water from your tap. It should take about 1 to 2 gallons. Less is fine, but more and you are not going to get a rich stock from one bird. Bring the water up to a simmer. You want to get the water to the boiling point, but you don't want it to stay there for any length of time. If you have to hang around the kitchen and watch for the boil, then go ahead and do it. You can prepare the vegetables while you do this. The reason you want to start with cold water and not boil the stock is so that the maximum amount of protein is extracted from the bones and the stock stays clear. If you boil the bones quickly, the proteins will coagulate before they steep into the water. Your stock will not be as flavorful, and it will turn cloudy. Once you get it to a boil, immediately reduce the temperature to a very gentle simmer. You may have to play with the setting at first to get it just right. Cover the stock. I use a cover because I don't want the stock to reduce, but I want it to cook for a long time and ensure the bones stay submerged. After you cover it, make sure it doesn't start to boil. Reduce the heat as necessary. A cover will keep more heat in the pot, and increase the effective temperature setting. You will want to simmer the bones for a total of about 5 hours, adding the vegetables for the last hour of the simmer. So, now that your bones have simmered for at least 4 hours, you want to add the ingredients listed below. Don't worry about peeling the onions or carrots. Just wash them off first. The idea here is to get the essence of the flavors into the stock without overcooking them. One hour is just about the right amount of time for this task. If you put the vegetables in for the entire five hours, you will get a good product, but the vegetable flavors lose their intensity, sometimes creating a slightly bitter flavor. After you have completely steeped the life out of all your turkey bones and veggies, the stock is done. You want to remove the veggies and bones from the stockpot, then strain the stock through a fine mesh strainer or a cheesecloth-lined colander. Because stock is loaded with protein, it is important to treat it with the proper respect by bringing the temperature down as quickly as possible to prevent any potential contamination. You can submerge zipper bags of ice into the stockpot while placing the pot in a sink full of cold water. This will get the heat out quickly. When the temperature of the water in the sink and the stock equalize, you can change the water in the sink. Your goal here is to get the stock to room temperature or lower before you refrigerate. If you happen to live in a cold climate with snow on the ground, you can cover the stockpot with plastic and take it outside to cool in the snow. Unfortunately, I am wearing shorts here in Central Texas while writing this article, so that is not an option for me. Once your stock is at room temperature or colder, you can portion it and chill or freeze it completely. Take an ice cube tray that you don't use for cubes, and fill that with some stock. You can use frozen stock cubes for all kinds of sauces or to enhance bouillon cubes or canned broths. You can portion the stock into zipper freezer bags by the quart or by the cup. Maybe you want to do a little of both. Get all the air out of the bags before you freeze them. Save enough stock for the refrigerator for any meals you are going to create with your leftovers in the next few days. Once your stock is completely chilled, you will be able to determine what the quality is. If your stock resembles a loosely congealed blob of egg whites, you have stock that you can feel good about. The gelatin and protein in the bones and meat scraps causes the stock to congeal. This type of stock is the reason why chicken soup is prescribed for people who are sick. It's powerfully healthy food that is easily digested. If your stock is firmer than egg white and resembles Aunt Esther's Leftover Gelatin Surprise, you have the really good stuff. It jiggles and wiggles, and keeps its shape. You have reaped the rewards of a labor of love, and you can be sure that anything you create with it will be full of flavor and nutrition. One more thing you can do with your stock once it's chilled is get rid of any unwanted fat that is solidifying on the top to make your stock even more healthful. Now that you have the basics on making stock from a leftover turkey, keep it in mind when you roast a chicken throughout the year. I like to save the carcasses from roasted chickens in the freezer until I get about 4 or 5 of them. I will also save any appropriate vegetable scraps that otherwise would end up in the trash and put them in a freezer bag to use them in my next batch of stock. It's a little bit of an effort, but there is almost no cost involved. Okay, I have completely exhausted the topic of stock. Now that you have some of the good stuff, what do you want to do with it? One simple thing to do is use it in place of water or canned broth in any recipe that calls for it. If you are making some rice to go with your turkey leftovers, use stock instead of water to cook the rice. Try adding stock to that can of condensed soup that tells you to add a can of water to reheat. What a difference! Now you have some real soup. That box of instant stuffing that says cook with water? Well, you guessed it; try your stock. For heaven sake, don't try this with canned broth or bouillon. The end result will have way too much salt in it. That's the beautiful thing about homemade stock. You control the salt. You can't reduce a can of broth, but you can reduce a cup of homemade stock to a thick syrup if you want to, concentrating its flavor without the salt. Here are a few quick recipes to get the ideas flowing. Over medium-high heat, sauté the onion in the olive oil until soft, about 5 minutes. Add the paprika and chipolte powder and mix it around to absorb the oil. Add the turkey stock and bring to a boil. Add the turkey meat, reduce to a simmer and cook until slightly thickened and reduced by about half. Season to taste with salt and pepper. Finish by stirring in the sour cream and serve over rice or pasta. Garnish with the cilantro. Makes two servings. This recipe can be easily doubled. Garnish: Tortillas, cut into thin strips and fried crisp, or crushed chips, diced avocado, Monterey Jack cheese. 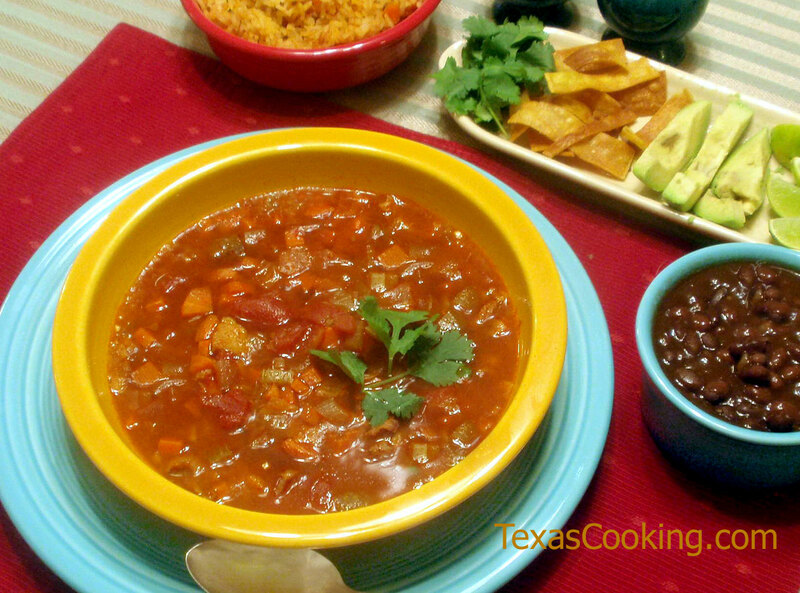 Tortilla Soup is one of those foods that has firm roots in a traditional Mexican dish, but by the time it gets to the table in America, it has evolved and changed considerably. That's okay with me, and one of the things I love about cooking in America. We are not so hung up on our traditions, and that gives us a lot of freedom in our cooking. So, if you don't like something in this recipe, leave it out, change it, whatever you like. You're the one that has to eat it! Saut the vegetables and the tortillas in a little oil until tender. Add the remaining ingredients, except the cornstarch, and bring to a simmer. Season conservatively with salt and pepper. (You want it to taste like it needs a little salt at this point.) Cook, stirring occasionally, until the tortillas are dissolved and broken up into the soup and the vegetables are very soft and partially dissolved, about 30 minutes. At this point, I like to do a little cornstarch mixed with water to give additional viscosity to the soup. This will allow the small particles of tortilla and veggies to stay slightly suspended in the soup. You don't want it thick like a sauce. You want to add a little body to the watery consistency. It should take about 1 tablespoon of cornstarch mixed with 1 tablespoon of water, depending on how much liquid has evaporated. Check the seasoning again at the end and adjust as necessary. To serve, ladle into a bowl over the crispy tortilla strips, and garnish with a happy portion of avocado and cheese. You can also add fresh cilantro leaves if you like. Makes one half gallon of soup. Enjoy cooking with the real stuff!